Tweezers possess the highest quality. These tweezers have an anti-glare satin finish. 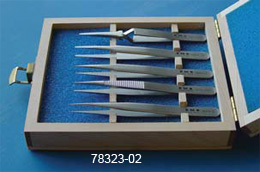 All tweezers are antimagnetic/anti-acid steel-SA (otherwise, specified). 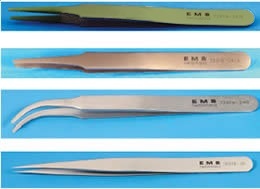 For all of our EM users, the tweezer styles #3, #3C, #4, #5, #51S, and 5B are all recommended for the precise handling of all EM grids. Anti-Acid/Anti-Mag SS - tips: straight, fine, superior finish. OAL: 120mm 4¾" Flat edges with fine tips and locking system. Anti-Acid/Anti-Mag SS - tips: straight, very fine, superior finish. OAL: 90mm, 3½" Short, flat edges, fine. Anti-Acid/Anti-Mag SS - tips: straight, fine, superior finish. OAL: 120mm 4¾" Strong, straight, fine, with Locking System. Provides a larger flat gripping surface for better handling of small objects without puncturing the (membrane, wafer etc.). Available with either straight tips (style 2A) or curved tips (style 2AB). Anti-Acid/Anti-Mag SS - tips: straight, flat, round, superior finish. OAL: 120mm 4¾" Flat accurate round tips, with Locking System. Anti-Acid/Anti-Mag SS - tips: straight, strong, sharp, fine, superior finish. OAL: 135mm 5.3" Strong, sharp, fine tips. Anti-Acid/Anti-Mag SS - tips: straight, extra fine, superior finish. OAL: 110mm 4 1/4" Extra fine tips, Locking System. Anti-Acid/Anti-Mag SS - tips: straight, extra fine, superior finish. OAL: 110mm 4 1/4" Extra fine tips, superior finish, Locking System. Anti-Acid/Anti-Mag SS - tips: bent, extra fine, superior finish. OAL: 110mm 4 1/4" As 5, bent tips for max visibility, Locking system. Anti-Acid/Anti-Mag SS - tips: very fine, curved, superior finish. OAL: 120mm 4¾" As 7, strong. Anti-Acid/Anti-Mag SS - tips: very fine, curved, superior finish. OAL: 120mm 4¾" Very fine, curved, Locking System. Anti-Acid/Anti-Mag SS - serrated handles - tips: straight, strong, superior finish. OAL: 110mm 4 1/4" Strong tips, serrated grips. Anti-Acid/Anti-Mag SS - tips: straight, flat, squared head, thin, strong, superior finish. OAL: 120mm 4¾" As 2A, flat and squared tips. Anti-Acid/Anti-Mag SS - tips: straight, extra fine, very sharp, superior finish. OAL: 150mm 6" Extra fine tips. Anti-Acid/Anti-Mag SS, includes styles 00, 2A, 3C, 5, 7. 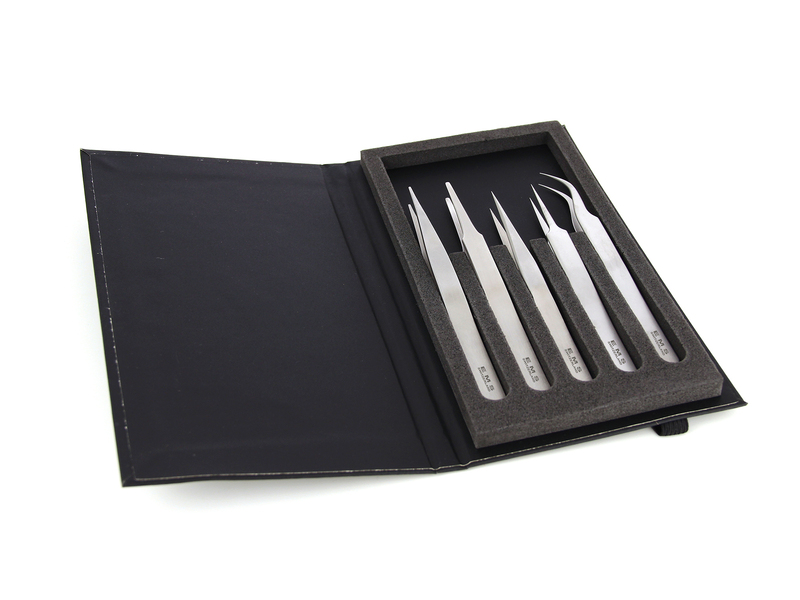 High precision tweezers set encased in top quality hard/foam wallet. Titanium - includes styles 00, 2A, 3C, 5, 7. 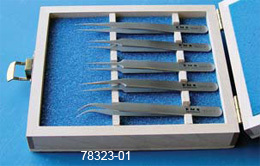 High precision tweezers set encased in top quality hard/foam wallet. This repair kit allows you to straighten, resharpen, and repair your tweezers that have been damaged or have become dull. Instructions are included with the kit.